To accomplish this noble task, the event’s front man, Pastor Louis Giglio, gathered a wide array of notable “celebrity Christian” personalities to prance, dance, proclaim and croon across the platform. False teachers aside, the stellar celebrity Christian line-up must’ve been a deal even at the $209 at-the-door ticket price. 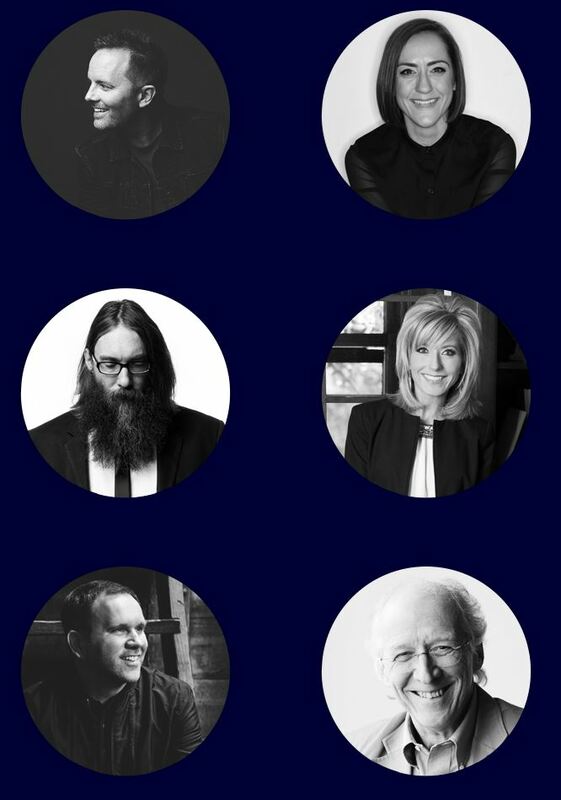 Among this year’s featured participants were the false teaching pastrix Christine Caine, the SBC’s resident recipient of revelation Beth Moore, and Hillsong New York’s “I’ve been on Oprah downplaying Christ” Carl Lentz. The pastoral presence of those who might have once been considered reliable, but who are now clearly off the rails of Biblical, doctrinal obedience – how exactly does one stand on a stage in a spiritual endeavor next to known false teachers when Scripture clearly says “avoid them”? (Romans 16:17, 2 Corinthians 6:14-18) – included heavyweight of “Christian” hedonism, John Piper, and former-pastor-turned-conference-celebrity Francis Chan. 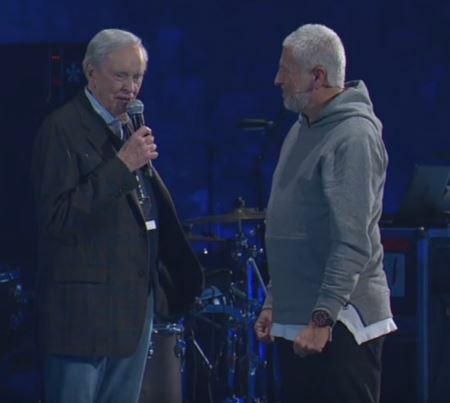 Even 84-year-old Charles Stanley – father of the “Scripture isn’t important” Andy Stanley – made an appearance to pray with Giglio for the gathering, his appearance giving the explicit nod to the event and an implicit thumbs-up to its headliners. These days, it seems, that enemy who appears as an angel of light is most often showing up cloaked in an evangelically-approved tunic of ecumenism. 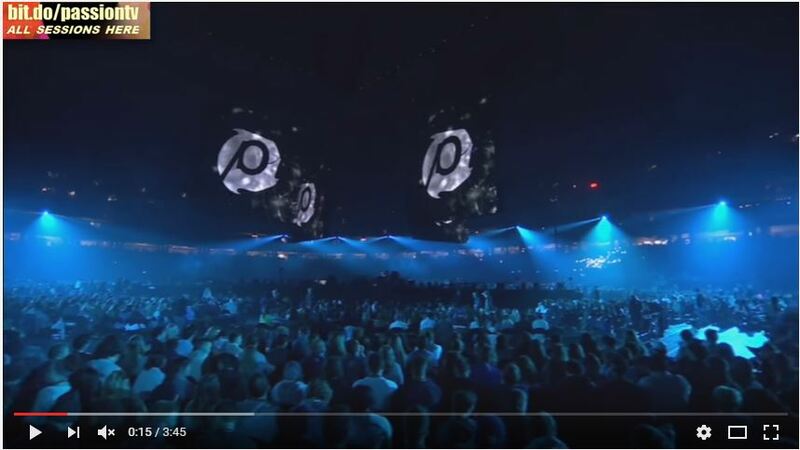 Among the musical talent obtained for the conference were Matt Redman, Chris Tomlin, David Crowder, Christy Nockels, and – because no gathering of millennials can possibly worship Jesus without them – the Hillsong United band. Devotional contributor Chris Tomlin noted as much in the text itself, writing “Jesus said that the world would know we are His by our love (John 15:35). Interestingly, He did not say ‘by our doctrine’ or ‘by our denomination,’ but by our love.” As we noted in our review, the Apostle Paul clearly identified those who divide the true church as those engaged in teaching and behavior “contrary to the doctrine you have been taught.” (Romans 16:17-18) Instead of obeying Paul’s command to “avoid them,” Passion paraded them across the stage, blasted them across social media, and posts them to YouTube. Doctrine doesn’t matter to Passion. 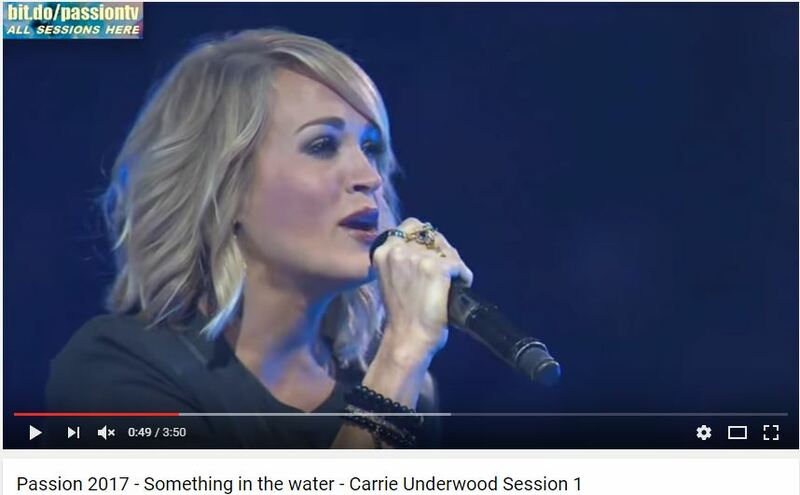 One of the most glaring examples of a disregard for what the New Testament places high regard for – doctrine (1 Timothy 4:6, 2 Timothy 4:3, Titus 1:9) – came in the crowd-stunning, surprise performance by country superstar Carrie Underwood. According to Wide Open Country, “Underwood joined Christian rocker David Crowder on stage at Atlanta’s Passion 2017, an evangelical conference that focuses on reaching college students.” Reaching them is, of course, one thing; but reaching them with solid Truth from Scripture is quite another. Passion might easily accomplish the first, while the latter seems casually disregarded. There is nothing in the water … rather, everything is in the Word. The concern with Passion 2017, though, isn’t the Word. Though the conference is appealingly besmeared with a millennial-friendly, church-approved slathering of Christian-ese, the actual “Jesus” of Scripture, of orthodox Christianity, is absent. “Jesus” may be lauded, but authentic believers must be cautious against just any “Jesus” being proclaimed. There are many “false messiahs.” (Matthew 24:24) Only one Jesus truly saves, and He is known in His Word, through its diligent consumption by the individual, by its responsibly taught proclamation by preachers and teachers, and apprehended solely by the illuminating, regenerating work of the Holy Spirit. “The Scriptures are not a sanctified pep pill. The Scriptures are there to give you knowledge.” John MacArthur, Why Believe The Bible? But experience doesn’t save. Gospel Truth saves. It’s clear in Scripture … from the lips of our Lord, no less … “I am the way, the truth, and the life.” (John 14:6) You’ll note He didn’t say, “I am the experience.” A few chapters earlier in John’s Gospel, the Lord identified His disciples, not as those who had an “experience of the Truth to be set free,” but that they would “know the truth, and the truth will set you free.” (John 8:31-32) That Truth is found by abiding in the Word.